By Pasco Gasbarro—Twelve great movies every book collector should see (and one everybodyy should skip). By Dan Gregory—How a Christmas card, a poem, a Time magazine article, and even a few novels inspired some of Hollywood's greatest films. 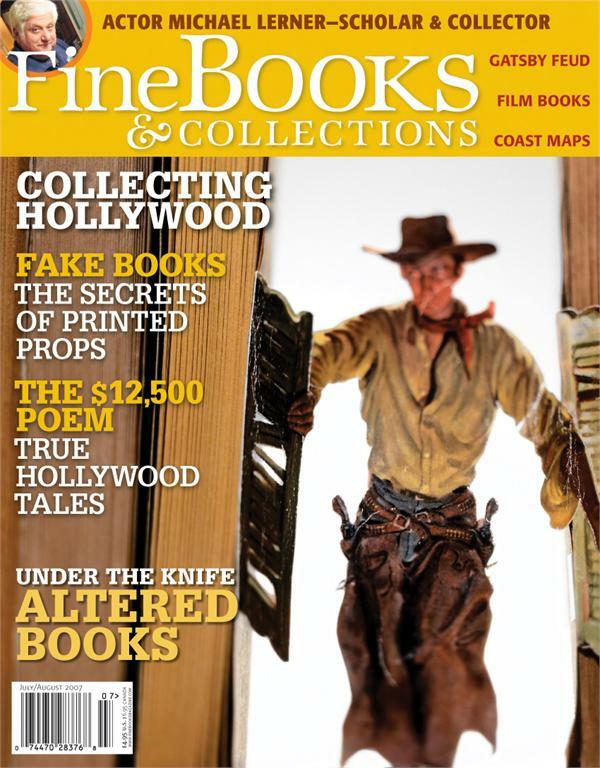 A collector’s checklist of the source books of the AFI 100. By Ellen Firsching Brown—Is taking a knife to a book desecration or reinvigoration? By Nicholas Basbanes—Collecting word books. By Derek Hayes—The U.S. Coastal Survey. By Richard Goodman—Lydia Rubio�s art of the book. By Joel Silver—Broadsides have changed the world. A Gone with the Wind fan(atic). Actor Michael Lerner, the Great Gatsby feud, the end of Gotham Book Mart, and more. Fine Pick: Adaptations: short stories on the silver screen. By Ian McKay—Mormon hymns, Yiddish customs, lighthouses, blue books, and more.